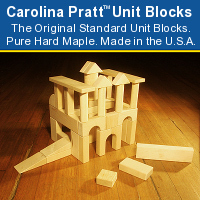 Welcome to Carolina Pratt Unit Blocks – The World's Best Wooden Blocks. March 19, 2019 — We are currently booked through June 2019. We make the highest quality standard unit blocks available for schools and families, which we custom manufacture after we receive orders. Although your unit blocks may ship earlier, current orders are only promised to ship before December 20th, 2019, or by August 15th, 2019, by special arrangement. It's true that the best things in life are worth the wait. Your blocks are not sitting in a warehouse, waiting to be shipped. Your blocks are trapped inside our high-quality kiln-dried FSC®-certified hard rock maple lumber, waiting to be set free. We build each set of standard unit wooden blocks as it is ordered. The sooner you order, the sooner we complete your blocks and ship them to you. Start with our CP01 standard unit blocks starter set for children of any age – ages one to ninty-one. Add our CP02, CP03, CP04, CP05 unit block booster sets, at least one booster set per additional child, to build a classroom-quality set of standard unit blocks that would make Melissa and Doug jealous. Purchase our CP61 Quarter Classroom Set of Standard Unit Blocks in Hard Maple for 4 to 5 children of any age – or build your set incrementally with the standard unit block booster sets listed above and shown below. Add our RX10 Booster set to add more of the most popular building block shapes to any set of Standard Unit Blocks. This 55-block booster set adds enough blocks for one more child. Each child in the block area needs 40 to 50 blocks to support parallel or cooperative play with peers. Our toddler-safe standard unit blocks are Hand-Made-in-the-USA from Forest Stewardship Council® certified Hard Rock Maple. The edges and corners are all smoothly rounded, and our blocks are solid hard rock maple (sugar maple) with NO coatings of any kind. They're 100% pure sugar maple. Our unit blocks are fine for little hands and little mouths. 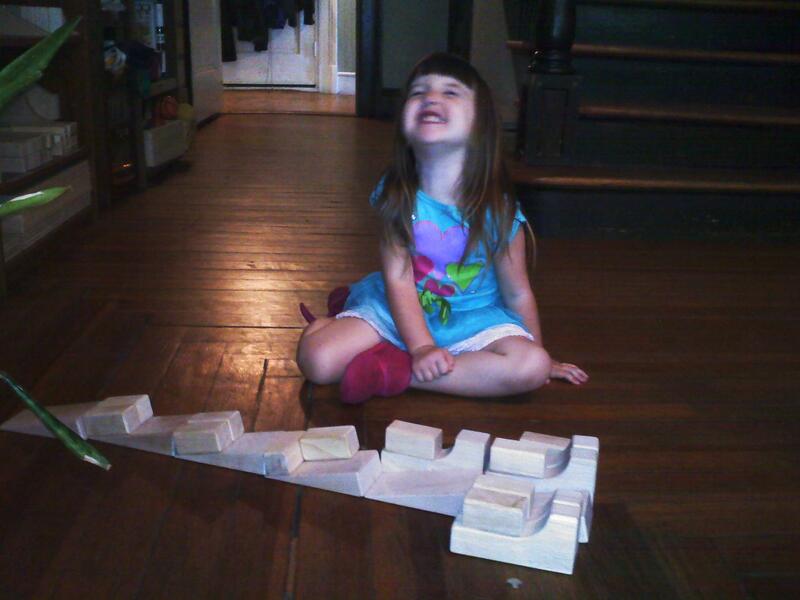 Our wooden block sets are designed for SUPERVISED PLAY for ages 6 months and above. To avoid head injuries, please don't allow kids (or adults) to build with blocks above their own heads or the heads of peers and younger siblings. Blocks are not about building until they fall on you or someone else. 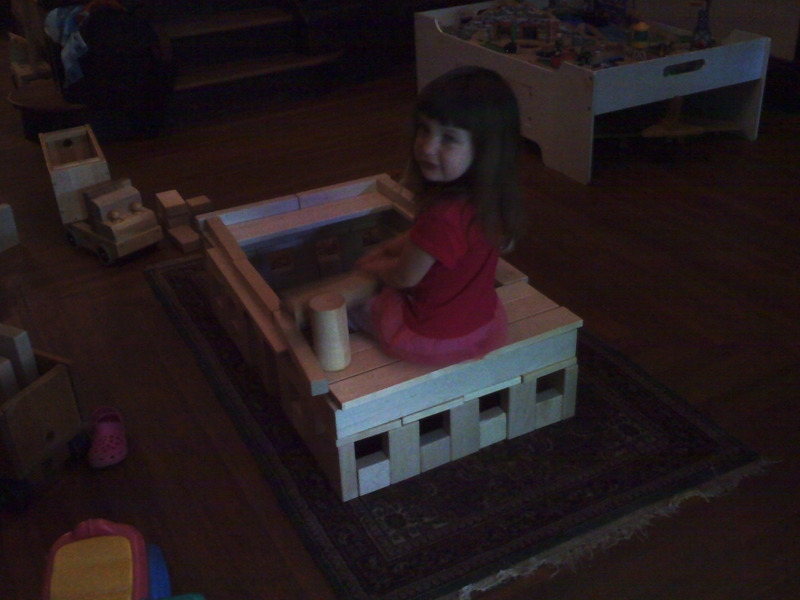 Blocks are tools for imagination. Thank you for supporting Carolina Pratt Unit Blocks — wooden blocks hand-made in the USA. Each set of FSC®-certified Hard Maple Wooden Blocks is precision-made in the USA — in Asheville, North Carolina — at our workshop, by our own hands, and then shipped to you. Orders placed online are handmade in the order received unless special arrangements are made. If you need delivery by a specific date, please note this when you place your order so that we can expedite your order. When you order, please include your phone number so that we can reach you if there are any questions. We custom manufacture the best wooden building blocks (standard unit blocks) available worldwide, Hand-Made-in-the-USA using only FSC®-certified Hard Rock Maple cut to a precision of +/- 0.005 inches (1/200 of an inch). Our beautiful wooden blocks are infant/toddler-safe, tested for Ages 0+. Recommended for supervised play for ages 6 months and up! Want to compare unit blocks sets to see which blocks are in each block set? Check out our Compare Wooden Block Sets page. Want to see pictures of block shapes? Please see our Same Shape Unit Blocks Sets page. Wooden Blocks Made in the USA – Shipped Worldwide! FREE Shipping within the United States! Celebrate Made in USA Wooden Blocks with Free Unit Block Shipping! FREE Shipping even to Alaska, Hawaii, Puerto Rico, U.S. Virgin Islands, American Samoa, Marshall Islands, Islands of Palau, APO/FPO boxes, and the lower 48 via USPS Priority Mail. International Shipping Only $60 to Canada / $90 Worldwide for CP01, CP02, CP101, etc. per 20 lbs box of unit blocks via USPS Priority Mail International. Yes, we ship to China, Australia, Japan, and Europe. International Shipping Only $20 to Canada / $30 Worldwide for any quantity of wooden toy dinosaurs or vehicles via USPS Priority Mail International. News about Carolina Pratt Standard Unit Wooden Blocks. Families — Please look at our infant/toddler-safe CP01 Starter Set of Standard Unit Blocks and our CP02, CP03, CP04, and CP05 Booster Sets of Standard Unit Block, precision hand-made-in-the-USA from FSC-certified Hard Rock Maple. Please purchase at least one of these sets per child for simultaneous play. Buying one each of these sets over time will equal our CP61 Quarter Classroom Set of Standard Unit Blocks plus our RX10 Quarter Classroom Booster Set which includes extras of the most high-demand pieces. School Blocks — For classroom booster sets, please consider adding our RX10 Quarter Classroom Booster Set to your existing classroom sets. We recommend our CP61 Quarter Classroom, CP62 Half Classroom, CP63 Three-Quarter Classroom, or CP64 Full Classroom Sets of Standard Unit Blocks plus RX10, RX20, RX30, or RX40Classroom Booster Sets with the most popular pieces, to support simultaneous play from five or six children up to your entire classroom of 20 to 24 children. Compare prices and contents of our Standard Unit Blocks Sets (click here) on our Compare Standard Unit Blocks page. December 22, 2018 — All 2018 unit block orders have shipped. We're booked 'til April 2019. Thank you for your support! February 23, 2017 — Our FSC® certification group has changed its third-party certifying body, which means that our certification code has changed. This does not change our suppliers, business practices, or end-product in any way. Effective February 23, 2017, our FSC® certification number is RA-COC-007619-BK. Our FSC® certification number was SCS-COC-004068-BK through February 22,2017. Our FSC® license code is FSC-C109876. December 27, 2016 — We are now accepting Standard Unit Block orders for March/April delivery. We've raised prices for the new year around $10 for most sets but are offering $30 off coupon for a limited time. Please use discount code BNQBK1483220 during checkout to receive $30 off your order of $200 or more. November 11, 2016 — Please Order Your Blocks Now for Hanukkah and Christmas. Our cut-off for Christmas and Hanukkah orders is tentatively December 4th. We custom build each block set as we receive orders and generally ship in the order received, allowing for special requests. June 24, 2016 — Time to Celebrate! We'll be completely caught up on unit block orders when the postman picks up tomorrow, with no remaining orders to complete. Within two to three days, all packaged unit blocks will arrive at their new homes and Zero customers will be waiting on their orders. The past six months have been an ordeal as we've struggled through fire and water (sprinkler system) damage, getting the shop back up and running, and waiting, waiting, waiting for the insurance company's builder to put back walls and restore electricity to the entire workshop. Through it all, our customers have been amazingly understanding, patient, supportive, and encouraging. Thank You! We wouldn't be here without you! April 6, 2016 — We do not support NC HB2 or discrimination of any kind. We proudly use PayPal to process payments. February 26, 2016 — Welcome to Carolina Pratt Unit Blocks! Due to post-fire reconstruction delays, orders are currently running anywhere from 8 to 12 weeks behind. Orders received in March may ship in May or June. One week ago, there was a small fire in our building which set off some of the sprinklers and destroyed blocks in production. We are thankful that no one was hurt and that we are able to order replacement stock. Our priority will be completing all existing orders and all new orders of CP01 sets, CP02 sets, and Same Shape sets of rectangular blocks to ship out on December 20th for domestic delivery by December 24th. We still have most vehicles and dinosaurs in stock and ready to ship. If you have other items that you wish to order for December delivery, please contact us. November 25, 2015 — We are expecting a shipment of milled FSC Hard Maple Unit Block Stock for holiday orders the week of December 15, 2015. We will be completing all existing orders and new orders of CP01 and CP02 sets, and Same Shape sets of rectangular blocks, that week to ship out on December 20th for domestic delivery by December 24th. We have most vehicles and dinosaurs in stock and ready to ship. November 19, 2015 — We are accepting additional orders for 2016 delivery only. We are not accepting any additional orders for December at this time. This morning, there was a small fire in our building. Although most out our inventory was spared from the sprinkler system, much of our equipment was soaked. We are drying everything out and will be running behind for the foreseeable future as we work to complete existing holiday orders. April 15, 2014 — Thank you for visiting Carolina Pratt Unit Blocks. We are currently accepting orders online for May and June delivery. Orders placed online will be handmade in the order received unless special arrangements are made. February 17, 2014 — Thank you for visiting Carolina Pratt Unit Blocks. We are currently expecting production and shipping delays due to post-holiday seasonal absences and inclement weather. We are currently accepting orders online for April and May delivery. Orders placed online will be handmade in the order received unless special arrangements are made. December 13, 2013 — We are busy filling your orders. New Orders placed now will be delivered after Christmas or in January. November 9, 2012 — We’re offering special financing through PayPal’s Bill Me Later! No Payments and No Interest if paid in full in 6 months on eligible Bill Me Later purchases of $99 or more. Subject to Credit Approval. Certain restrictions apply. July 23, 2012 — Looking for FSC®-certified products? We're now FSC®-certified through our new FSC® certification group. Our new certification number is SCS-COC-004068-BK. Our license number is FSC® C109876. Although we've always used FSC®-certified Hard Rock Maple, we've opted to be externally certified as part of our commitment to responsible forestry. 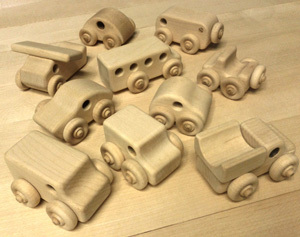 May 16, 2012 — New Wooden Block Play Vehicles! We now offer individual vehicles, sets of three, nine, and ten. Pictured is a Set of 10 Wooden Block Play Unit Block Play Made in the USA Toy Vehicles including Wooden Toy Airplane, Wooden Toy Cars, and Wooden Toy Trucks, all made in the USA with FSC® certified Hard Rock Maple. May 14, 2012 — They’re alive! Although the Brontosaurus has always really been an Apatosaurus, and the Triceratops may now be only a juvenile Torosaurus, you can take comfort knowing that the T. Rex is still a Tyrannosaurus Rex, a tree is still a tree, and these classic Hard Maple Wooden Toy Dinosaurs are built solid enough to withstand the moody seas of scientific debate and your preschool or kindergarten classroom. These Dinosaurs are versatile enough to destroy a city or help an infant bring in new teeth. Perfect for infant teething and big kid block play. February 26, 2012 — We’re happy to announce a new sister competitor site which offers the same highest quality, best-ever, Made-in-the-USA hard maple Wooden Blocks. If you want to buy wooden blocks for your kids á la carte, this is a great option. Please visit Maple Oatmeal Wooden Blocks at "Mo Wooden Blocks dot com" or click this link to buy wooden blocks in all sizes: http://www.mowoodenblocks.com. January 1, 2012 — Did you forget to order your FSC® 100% HARD MAPLE wooden blocks? Make your last minute purchases at 2011 prices! (Yes, we have to raise prices in January.) We Wish You a Happy, Healthy New Year! May your world be limited only by your imagination and may your imagination have no limits! December 15, 2011 — Merry Christmas and Happy Holidays to Everyone! Please place your Christmas orders by Sunday, December 18, if possible. Our last shipping day before Christmas is Tuesday, December 20. November 24, 2011 — Carolina Pratt offers another hard maple wooden blocks set specifically for parents who accidentally purchased a Melissa & Doug 60 Standard Unit Blocks set. We call it our “Oops, I accidentally bought a Melissa & Doug 60 Standard Unit Blocks set” set, or “CP06 Big Kids Big Wooden Blocks Unit Blocks Set in Hard Maple” for short. It’s a sweet deal with 20% more block building material than Melissa & Doug 60 Standard Unit Blocks, filling in the missing larger unit blocks and under-represented blocks. Free shipping included through the United States. October 22, 2011 — Carolina Pratt joins the Asheville Go Local Card fundraiser for local public schools, pledging $15 (the price of a Card) for each wooden block order of $39 or more placed online to be hand-delivered locally. October 15, 2011 — Share the joy of well-made hard maple unit blocks. These are the wooden blocks preferred by quality preschools, childcare centers, and elementary schools. These are NOT the cheap imitations made from foam, composite wood, rubberwood, or another unspecified soft hardwood, or non-specific "mixed" maple that splinter easily and won't pass the "Under Age 3" toy safety tests. These are NOT the bargain building blocks that are too light to be stable and not accurately cut which frustrates builders young and old. Carolina Pratt Standard Unit Blocks are Made in the USA and cut to an accuracy of one half of 1/100 of an inch. 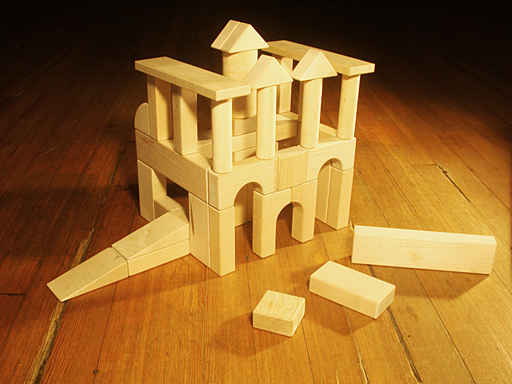 Perfect for the implicit learning of shapes and proportions built into dramatic play with quality wooden blocks. October 13, 2011 — Now serving Sweden and the rest of the EU, plus Austrialia, New Zealand, and Japan. Items are made to order and then shipped using USPS International Priority Mail at a discounted price of $44 per (up to) 20 pound flat rate box. September 2, 2011 — School and Institutional Buyers: We accept Purchase Orders. We’ve added a Toll-Free Fax Number (888-516-0210) for your purchase orders. Just proceed to checkout and select “Purchase Order’ as your method of payment. Additional directions are listed on our Purchase Orders page. Questions? Call Us Toll-Free 888-799-0797. August 30, 2011 — International Customers: Using new USPS Priority Mail International Flat Rate shipping options, we can now ship our unit blocks to Canada and Mexico for as low as $20 for 20 lb box of unit blocks. Most of the unit block sets we offer (unit block booster sets, Rx sets, bulk unit blocks, same-shape unit blocks) fit in this size box. Free Shipping Insurance and Handling are now include at no additional charge. Contact us for USPS Priority Mail International shipping to schools other countries. For reference, a Standard Unit Wooden Block made from Hard Rock Maple in the basic unit shape (5.5 x 2.75 x 1.375 inches), a double unit plank (11 x 2.75 x 0.6875 inches), or a double unit pillar (11 x 1.375 x 1.375 inches) weighs about 0.53 pounds. A hard rock maple double unit block (11 x 2.75 x 1.375 inches) or a quadruple unit plank (22 x 2.75 x 0.6875 inches) weighs about a pound. A quadruple unit block (22 x 2.75 x 1.375 inches) in hard maple weighs about 2 pounds. Twenty pounds is a lot of maple wood blocks! August 27, 2011 — We've updated and simplified our wooden unit block shipping. FREE WOODEN BLOCK SHIPPING available now for ALL BLOCK SETS for EVERYONE in the continental United States. August 27, 2011 — Using new USPS Priority Mail Flat Rate shipping options, we are now able to offer FREE WOODEN BLOCK SHIPPING to Alaska, Hawaii, and APO/FPO postal addresses on all wooden block orders up to 50 lbs. (almost everything) — plus greatly reduced shipping on larger sets. August 18, 2011 — Our Unit Block sets have new photos. Now is the time to start placing your order for shipping or personal delivery in September. August 15, 2011 — We added great photos for our new CP01 Age 1-2+ Infant Toddler Starter Set of Unit Blocks and CP02 Age 2-3+ Toddler Booster Set of Unit Blocks. The "Age 1-2+" and "Age 2-3+" means that these unit block sets are suggested for children starting at the age listed and up! We also have unit block booster sets marked "Age 3-4+", "Age 4-5+", and "Age 5-6+". These sets allow you to start on a small budget and grow with incremental booster sets into developmentally appropriate preschool or school set of Unit Blocks as your child and family grow. All of our blocks are made from safe, hypoallergenic Hard Rock Maple, feature smoothly rounded edges, and are suitable for infants and toddlers, as well as older siblings and friends. Of course, you should still supervise young children at play. Unit blocks are designed for use by children with immature judgment. Loving supervision is required at all times. 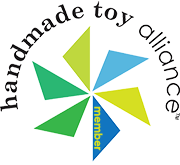 August 1, 2011 — Carolina Pratt Unit Blocks joins the Handmade Toy Alliance. July 31, 2011 — We added 19 More Bulk Unit Blocks in convenient one-box sets today. An order of 128 Small Unit Block Triangles means 8 hours of work right here in Asheville. Two hundred orders is someone's annual income! Support safe wooden toys and our regional economy by purchasing standard unit wooden blocks made here in Asheville, North Carolina. July 30, 2011 — We actually added an entire new line of Unit Blocks for Home and Home-based Childcare this week, starting with an Infant Toddler Standard Unit Wooden Blocks Starter Set with affordable annual or semi-annual age-appropriate Unit Block booster sets so that your blocks grow with your child and your family! 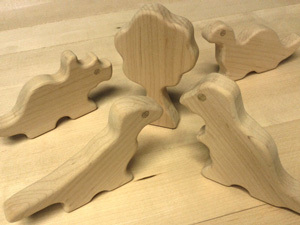 July 28, 2011 — We will be adding two new sets of Standard Unit Wooden Blocks for Toddlers this week. “Love” us on Facebook, Twitter, and Google+. Click “Like” on Facebook and tell your friend about us. Follow us below. Give every page a big +1 on Google. Win-Win. You get updates, discounts, special offers, and more by clicking the "Like" button for our Carolina Pratt Unit Blocks page on Facebook. Your friends get to learn about us, too. Also Follow and retweet us on Twitter @unit_blocks or https://twitter.com/unit_blocks. Win-Win. You get updates, discounts, special offers, and more by following Carolina Pratt Unit Blocks page on Twitter. Your friends get to learn about us, too. Also Visit us on Facebook at www.facebook.com/unitblocks. Welcome to Carolina Pratt Unit Blocks. We’re adding new photos of our Unit Blocks and additional information. If you don’t see what you’re looking for on our website, please call us or click the Live Help button for assistance. Our Carolina Pratt Unit Blocks are precision manufactured to within one half of 1/100 of a inch by a real, live human being, using infant-safe Hard Rock Maple — the hardwood of choice for wooden blocks for toddlers and preschool Standard Unit Blocks — the original Standard Unit Block, made in the USA from FSC® Mix Credit certified Hard Rock Maple. We are serious about making the best wooden blocks for your children at competitive prices including Free Shipping for our Hard Rock Maple Standard Unit Blocks via USPS Parcel Post and USPS Priority Mail. How about healthy infants, toddlers, children, adults, schools, churches, and communities? With our Hard Rock Maple Standard Unit Blocks, you can build just about anything. We are building a better future — and so can you. We recommend against rubberwood, other Asian hardwoods, foam, cardboard, and plastic unit blocks. In addition to any health concerns, light weight blocks are easier to knock over, which is frustrating for young builders. We source FSC® certified hardwood. We choose the highest currently available certifications for the wood that goes into our unit blocks because FSC® inspection with a verifiable supply chain supports sustainable forestry for the health of the youngest generation and for generations to come. FSC® certifications can be used by schools and facilities to achieve goals for LEED Credit-Opportunity Contributions for Certified Wood and Low-Emitting Materials. We clearly mark all our invoices as Made from FSC® Mix Credit Certified Hard Rock Maple for those buyers who require documentation.